Yesterday looked like it would be one of those Bank Holiday Mondays that meant nothing, and would just pass without anything special to remember it by. Wrong. Having heard on Smooth Radio that Henry Cooper had died, I went online and actually scrolled obliviously past the first story on the BBC News website, which was about Osama bin Laden, to find out how old Henry had been, and how he had died. It was only when scrolling back up that I discovered that bin Laden had been killed by US Special Forces inside the walls of his compound in Pakistan. Big news. Poor old Henry Cooper. I know a lot about Osama bin Laden and al-Qaeda, having read, among other useful tomes, the definitive Al-Qaeda by Jason Burke (whose services were quickly pressed into action by the Guardian – he’s all over this morning’s edition and his obituary, with Lawrence Joffe, of bin Laden is superb, albeit clearly on file, as these biggies tend to be), and The Looming Tower by Lawrence Wright, which traces 9/11 back to Egyptian scholar Sayyid Qutb’s visit to America in the late 40s and its impact on his influential fundamentalism within the Muslim Brotherhood. In the latter, Wright records Osama bin Laden at a wedding before the 9/11 attack quoting a line from the Qur’an: “Wherever you are, death will find you, even in the looming tower,” which has added potency now. We know quite a lot about bin Laden, at least up until the point where he disappeared into the caves and became number one folk devil in the West. To me, he is more than a symbol. To most, that’s all he is. So his death probably appears symbolic too. 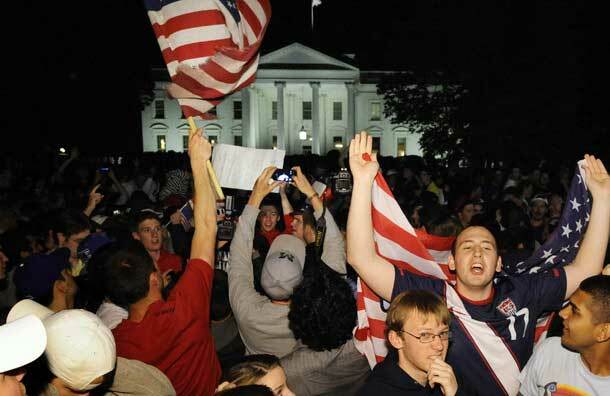 You can understand why those revellers at Ground Zero and the White House felt that bin Laden’s death – not his capture, but his death – was cause for spraying beer into the air and painting their faces red, white and blue in the middle of the night. Many will have experienced the 9/11 attacks at close quarters; maybe some of them had links with people who died. But I don’t mind admitting that I was instantly troubled by the scenes being bounced back from the United States of this unseemly and ill-thought-through triumphalism. At least our street parties on Friday were in honour of a wedding between two people we have never met; these street parties were in honour of the death of a man they have never met. I know how many deaths bin Laden is said to have caused. And I know why Americans, in particular, feel that bin Laden deserved to die, but I am physically unable to cheer and whoop at the death of a person, whoever they are. Surely by wishing death upon someone, we are no better than bin Laden himself. Or, as I wrote on Twitter yesterday at the height of the euphoria, am I being a big softy? I found the dialogue on Twitter to be rigorous and interesting. It took up more of my Bank Holiday Monday morning than I’d planned. Meanwhile, about 50 people forwarded a joke to me about bin Laden making the sea homeopathically evil by being buried in it. This is not unfunny, but it hardened my killjoy position. I really didn’t think this was a time for levity. Also, when a joke has been Re-Tweeted at you that many times, it goes get annoying. Nobody’s individual fault, but it does. So I became a misery yesterday, and wanted to have a serious discussion about the events of that morning, when all around – or so it seemed – triumphalism abounded. I made the mistake of watching some Fox News. I switched over pretty smartly. Most commentators on the proper news sounded notes of caution. The word “evil” was bandied about. How many people do you have to kill to be officially categorised as “evil”? Are you evil for killing one person? I might say you are evil for swatting a fly. Bin Laden is, or was, “evil” apparently. Having masterminded the deaths of many, he is certainly not nice. You don’t want a bloke that at large, masterminding more attacks on people from his cave. You want to round a bloke like that up and make sure he stops masterminding. But people who use the word “evil” seem confident that they are qualified to decide who is and who isn’t evil. I don’t have that confidence. My moral compass is bound to be different to yours. It’s safer not to use the word “evil”. It gets you in trouble. It’s like Heaven and Hell. Life isn’t that easily partitioned. It’s like the word “hero”; use it too freely and it loses its meaning. Not every soldier who dies can be a “hero,” or what are we to call those who perform actual acts of heroism? Anyway, the dust has settled somewhat. I suspect, and hope, that the initial euphoria of flag-draped bloodlust has died down a bit in the US. I don’t particularly want to see it, but has anybody seen bin Laden’s body yet? Just asking. And is Pope John Paul II in Heaven? He’s currently being fast-tracked to sainthood, and was beatified in Rome yesterday. But wasn’t he in charge when all that child abuse was being covered up, and its perpetrators being protected from the police? Surely a man who lets that happen cannot go to Heaven? This is why it’s better to not believe in Heaven and Hell – that way, you can cover up child abuse with impunity, and nobody can call you a hypocrite! Sorry, where was I … ?